This was the second night of the 16th NATIONAL TEEN CONVENTION hosted by the Longview Baptist Temple of Longview, Texas. Pastor Bob Gray II and his staff did a fabulous job of preparing for this convention of teens from all over America. The theme is KEEP THYSELF PURE! There is a 24 foot high wedding cake with a bride and groom on top. They had some fun using THE PRICE IS RIGHT format before the preaching. Dr. Bob Gray II preached on THIS IS NOT THE TIME NOR THE PLACE. He did an excellent job of preaching! 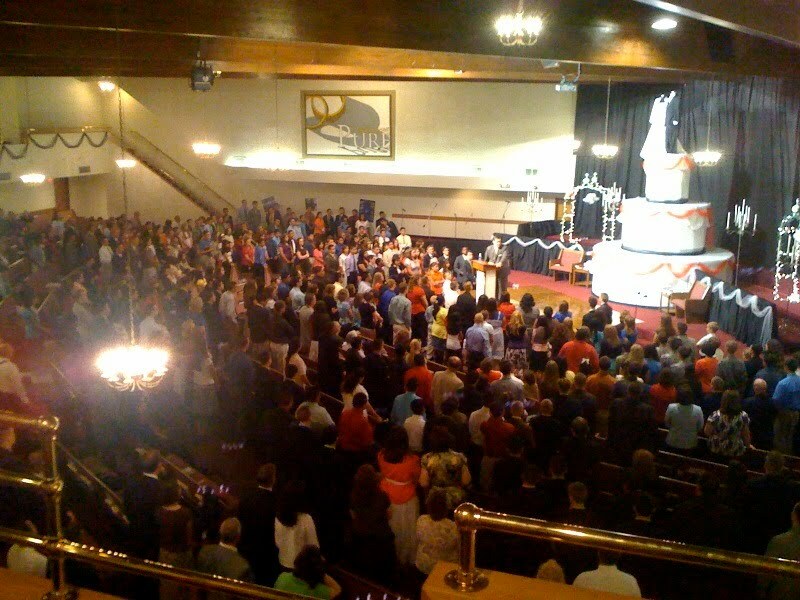 At the invitation time the altars were packed with young people. During the message there were decision cards placed on the altar and at any time a young person could leave their pew and go to the altar to pick up a decision slip. They did not have to wait until the invitation time. Several took advantage and did so! I will be teaching the workers this morning, preaching at the 11 o’clock hour, and preaching tonight at 7. I am looking forward to the services! GOTTA LOVE SERVING THE LORD!